Is one of your satelitte receivers not working correctly? Apache RV Customs configures and installs satelitte TV systems. If your satelitte isn't working correctly or you want to add a receiver or upgrade your system call Apache RV Customs and we'll get your Satelitte TV working right! 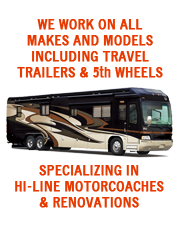 Apache RV Customs is an expert in Audio/Video technology and installation. Have a TV Party and enjoy the next big event on a large screen Hi-Def TV with a custom Entertainment System installation or upgrade at Apache RV!